Zacharie Cloutier, who was born in Mortagne au Perche in 1590. 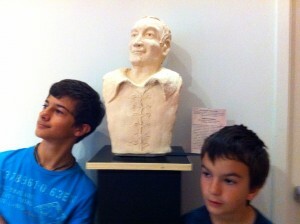 Apparently,Zacharie was one of the first french pioneers to “New France” (Canada) in the early 1600′s. I was hoping to find some information about Zacharie while here and, at the very least, see the land from where he came. 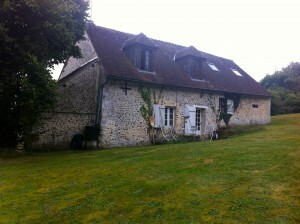 We booked ourselves a little “gite” cottage in Colonard Corubert about 17 km from Mortagne. It was a bit out of the way, but, it was a very special place. It was called Le Chene, The Oak, because of all the oak trees on the property. hillside with views, horses in pasture across the driveway, a huge lawn area with old orchard fruit trees, and even a tennis court. The owners were English/Scottish and lived on the property. There were 4 old houses on the property, apparently it was a little village in times past, but had been consolidated into one property. 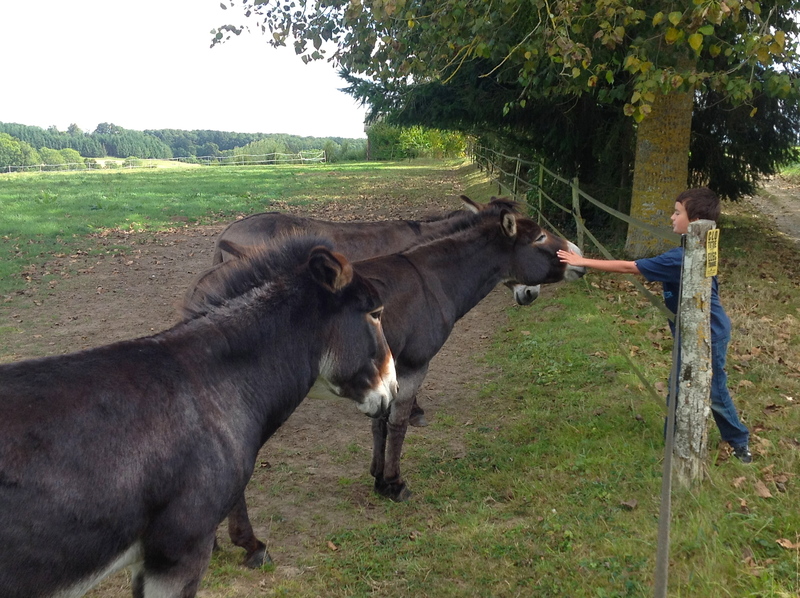 I really felt comfortable here and told the boys it was probably because Perche was where our ancestors came from. We would go back to Perche and this cottage in a heartbeat. Not far from the cottage is an Emigration Museum in the town of Torouvre. This is where the history of the first pioneers to Canada is displayed. The Cloutier name is all over the place. 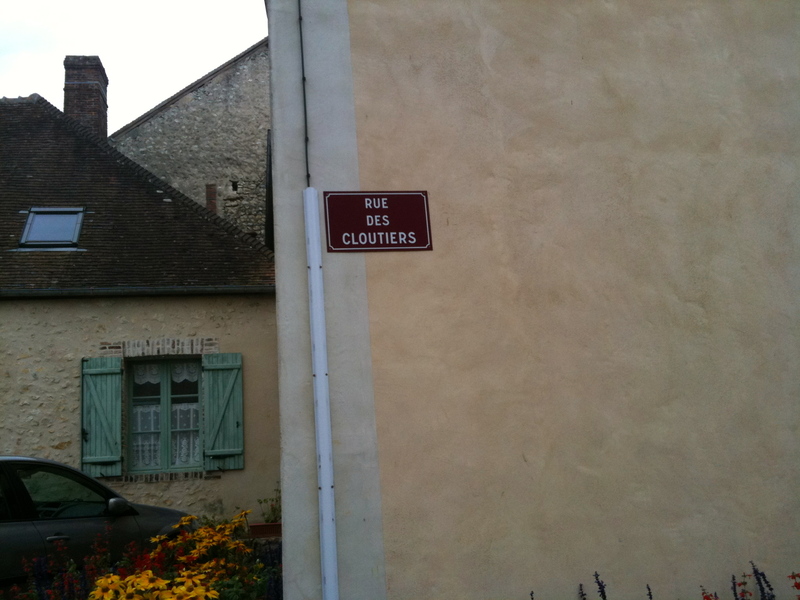 I even found Rue des Cloutiers just down the street. There was so much history here. 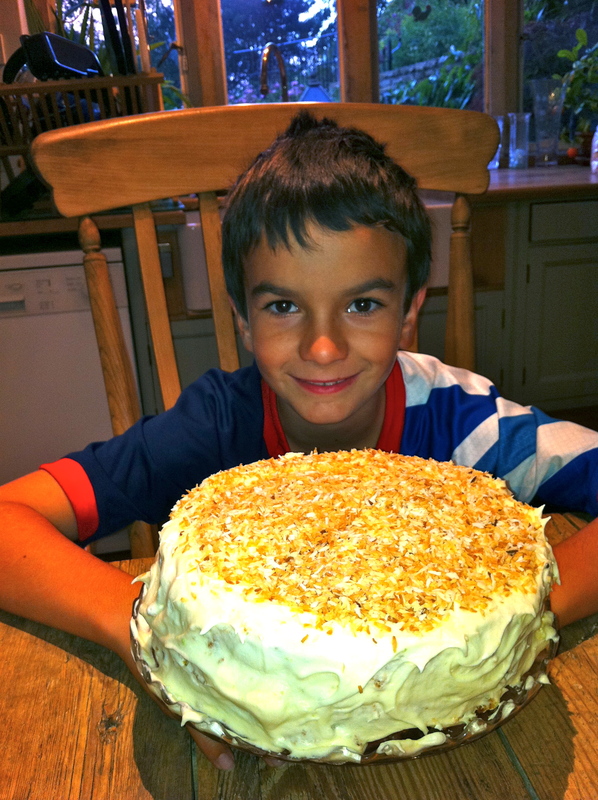 Zacharie was a master carpenter in the area and was asked to go to Canada probably because of his skills. 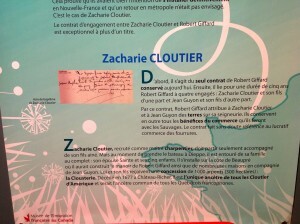 Apparently, the name Cloutier means “one who nails.” My grandfather, Ovide Cloutier descends from Zachary’s son Charles. I have all of the Cloutier names through the generations down to my mom. The only thing I was not able to find was the burial place of Zacharie’s parents, Denis Cloutier and Renee Briere. I spoke with the City Hall in Mortagne au Perche and apparently, in those days, the practice was to use the same grave site in the church yard over and over again. So, even though I know that they were supposedlyburied in St. Jean de Baptiste parish, I was not able to find them. 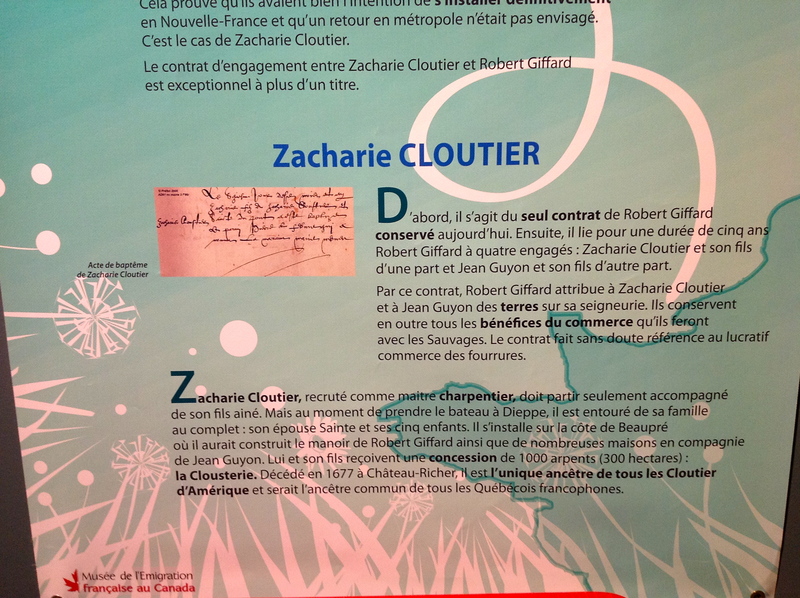 At the museum, we found a write up about Zacharie Cloutier and how he was one of the first immigrants to French Canada. This has been an interesting journey into my past and I am so happy to have had the chance to visit this area. Zacharie must have been a very courageous and strong person to leave his homeland for a new adventure in the untamed wilderness of Canada. He also must have had a strong sense of family because he did not want to leave them behind, but instead, brought all of them with him on his first trip across. He was very successful in the new land and lived to be 87 years old. 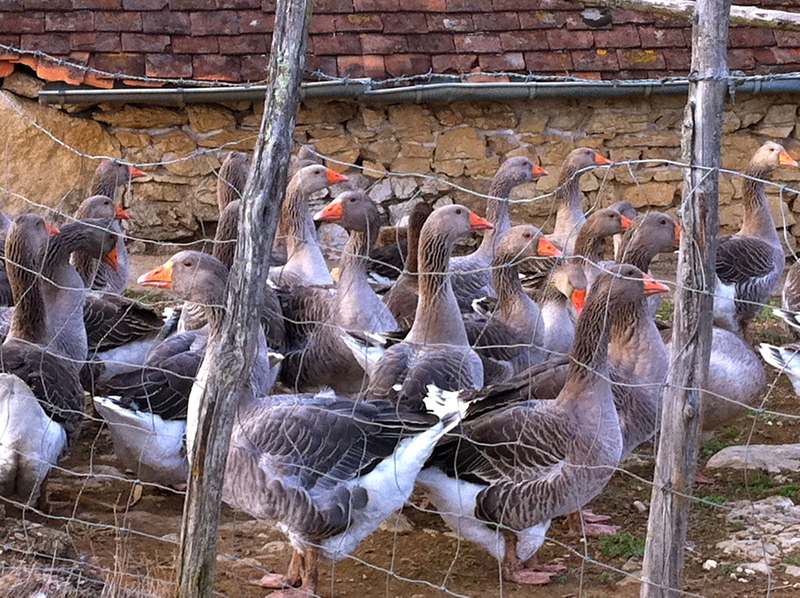 A small foie gras farm operation where the geese get to live outside. 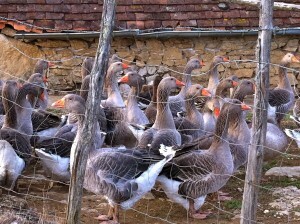 If we buy foie gras, we will buy it from a farm like this nearby. This week we went to Lauscaux II and Font de Gaume caves. 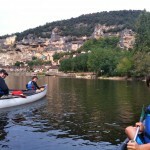 Lascaux and Font de Gaume are located in France in the Vezere valley. The caves were formed in an area of limestone rock. cro-magnon man made the cave paintings. The paintings were made 17,000 years ago. Lascaux II is actually a copy of the Lascaux cave. Why? Lascaux cave was closed to the public because the ‘white disease’ from too many visitors was making the paintings disappear. Lascaux II is made of concrete and iron, and artists made copies of the original cave paintings. Lascaux cave has 900 animal paintings. There are paintings of bulls, horses, deer, goat, and wooly rhino. Font de Gaume is a real cave that people can walk into and look at real prehistoric cave paintings. Font de Gaume used to have a lot of stalactites, but people took them out to make it easier to walk into the cave. Font de Gaume has 230 animal paintings. There are pictures of mammoth, horses, bison and deer. Cro-magnon man used red, orange, white, black and brown colors made from minerals to paint. Cro-magnon man engraved the rock, used animal skin dabber brushes, blow pipes from animal horns, and their fingers to apply paint. I think cro-magnon man painted the animals as Art and to promise good hunting. From September 13th to the 16th, my family and I visited the Normandy beaches where D-day took place on June 6th, 1944. While there, I went to many different places including Omaha beach and Pointe Du Hoc.These were two of the places where the U.S.
and allies attacked the Germans. 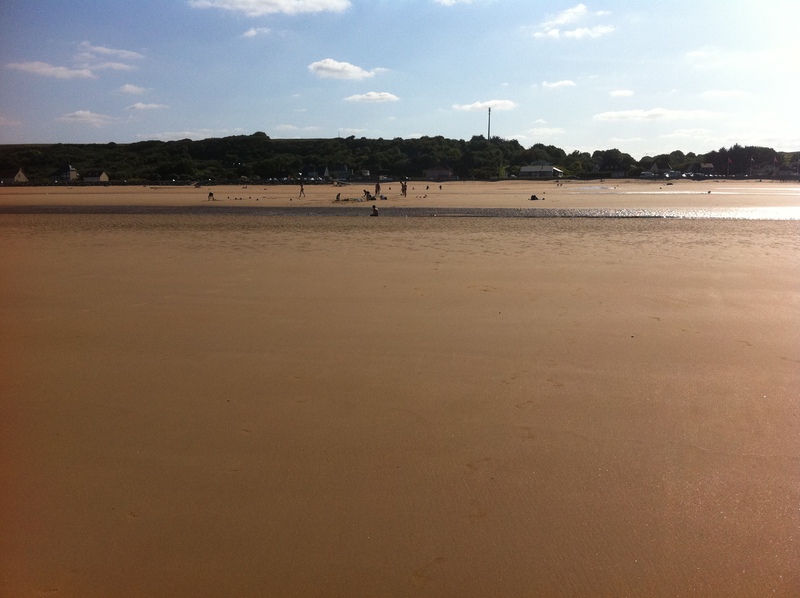 The Americans landed here and had a difficult time getting inland for the Germans had the beaches well defended. 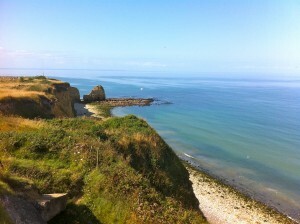 Omaha beach and Pointe Du Hoc have very different landscapes. The wide flat sand and large bluffs of Omaha made it easy for Germans to attack from above and defend once the Americans landed on the beach. 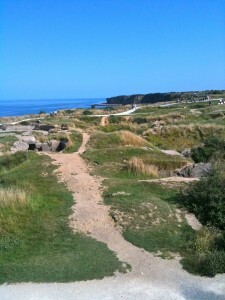 At Pointe Du Hoc the 250 American rangers had no easy feat either; there were sheer cliffs that they had to summit while Germans were shooting down at them. Once again the Nazis had the higher ground. Although both operations suffered many casualties, they both were successful. These landings eventually led to the retaking of Europe and the defeat of Germany. 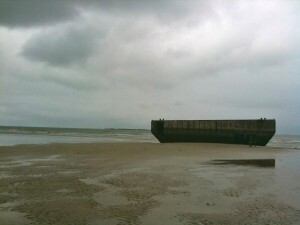 During my stay in Normandy, I also went to a German base that was apart of the Atlantic Wall. 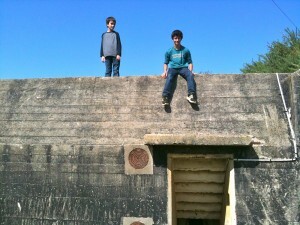 This base was a German defense unit. It bombarded allied troops for three days till the final assault on June 9th, 1944. The attack from the U.S rangers took five hours to completely secure the base. 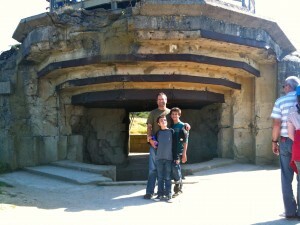 As I walked through it, I saw thick concrete shelters and trenches all over the place. shelters and weapons, I could see why it took so long for the rangers to capture it. After the war was over, there were many memorials including cemeteries for the dead soldiers who gave their lives for the freedom of other people. 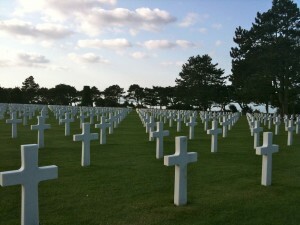 At the American cemetery in Colleville-Sur-Mer, there are 9,387 graves for the Americans who died throughout World War II in Europe. 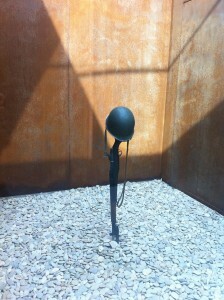 When I went there, there was a museum all about D-Day and the soldiers who fought and died in the war. The museum had three sections: Preparation, Determination, and Sacrifice. The soldiers had to prepare for the actual invasion. This included the plans of attack and the training each person had to complete. Next, in the heat of battle, soldiers were determined to do their job. They did not give up and retreat, but kept pushing. And lastly, the sacrifices they made were many. Being crippled for the rest of your life, both mentally and physically, was sometimes worse than that of dying. I felt sad after reading the stories about these men and women. Standing on the beach, I thought about how the soldiers must have felt going out there and possibly not coming back. They had great courage. How their families must have felt when they received a telegram about how their son or daughter had died in the war. 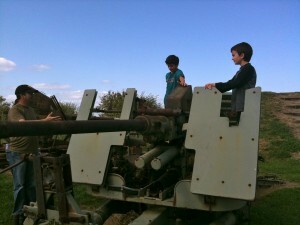 I also pondered about what these battle fields looked like during the war. Normandy now shows few battle scars. The view one sees when they look over onto the beach makes it is hard to believe that so many people had died there. I have definitely slowed the pace of my blogging. It is not that I don’t have anything new to write about. Quite the contrary, our travels continue to be quite rich in new experiences and adventures. Now, in fact, many things that I can write about have piled up. So I will start with our experience with leasing a new car in France. all inclusive. That is so much cheaper than what you could rent a car for here in Europe and includes the insurance, etc. We went with Renault because their website was the easiest to use and their service was fantastic. It usually takes 30+ days to get the paperwork and order completed, but, we did it in 10 days and they had the car ready on time at the delivery site just outside of Paris. The car is called a Kangoo (Can go) although, that is probably debatable. When I told my Swedish friend Per on Skype that we have a Renault Kangoo, he made a comment that he hoped we got the diesel version because a Kangoo gas engine would barely make it over a hill. Well, the diesel Kangoo is still quite a weak engine, but it can make the 130 Km speed limit on the toll freeways, and well, not driving fast allows us to take in the sights better. We really got this car for its relatively large luggage space in the back, which we fill up with our bags and supplies when moving bases. The boys are bummed that there are no back seat windows. Both back seat doors are sliding doors, like on minivans. This is kind of strange for such a small car. I would never buy one of these cars, but it is new, the cabin is spacious and comfortable, and gas mileage is excellent. It will do us fine for the next few months. What happens when you put gasoline in a diesel engine? 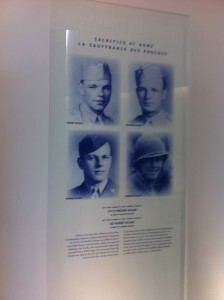 : So, we pick up the car without hassle and start out for Normandy. A few kilometers from the gas station, the engine stops working. I can write about this now. 60 kilometers outside of Paris, only one hour or so of driving the brand new car we leased, I pull into a gas station at a highway rest stop. I am realizing that really I don’t remember my ‘gas station french’, although I may never have actually learned the vocabulary. Mauritania, where I learned my French, pretty much does not have gas stations. meltdown because I knew what a colossally stupid thing I had done and I didn’t know how easy/hard it would be to fix this. We were in a dead car on a busy highway at 3 in the afternoon. To compound matters, we had not yet bought a French cellphone simm card. Our UK simm card had like a dollar-fifty left on it. Not much when you are calling for service assistance and they ask you to hold as you wait for the English speaking person to get on the line. Another American credit card problem – we could not use our credit card to top up the simm card by phone, we could only do this at a store. Gigi had to plead with the Orange service person to give us ‘emergency credit’ of 3 dollars…twice. This finally allowed us to complete our communications with the assistance service. One great thing about the Renault lease program is EVERYTHING is insured. They even have printed on the instructions ‘when wrong gas put in the car.’ The guy on the phone even acknowledged that this was a common reason for breakdown. 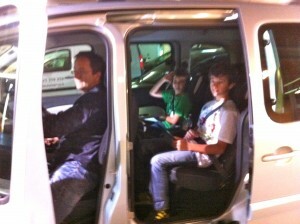 The boys just played on their iPads in the back seat. Gigi was frazzled. I was fried. One hour wait, 45 min tow ride with little talking, an hour at the service station draining the gas from the engine…and voila! We were back on the road again. Both Gigi and I feared that we were going to be stuck the night in whatever minor village the service station was located in. We couldn’t communicate, we just were just groping our way along. In the end, the roadside assistance was very good, and the service station people very nice. And the solution to the problem was not nearly as bad as I had feared. 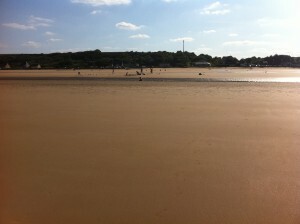 We made it to our Normandy beach hotel about 4 hours behind schedule, and we collapsed into the beds upon arrival. Now, it is time for the family to learn some French. We have Rosetta Stone French on our laptop, but we have not been practicing. It is time to dust the software off and get to it. We plan to make France our base for the next 5 months or so. voila!…had dinner in our rented Paris apartment. 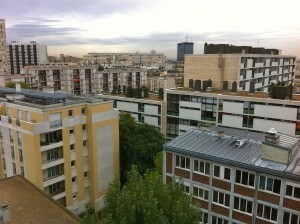 We are staying in the Belleville district on the northeast side, just inside the ring road of Paris. Tomorrow, we will take the metro into the town center and see some sights. 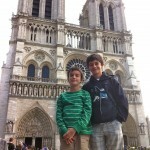 We are going to leave the museums and other tourist pay attractions for a future visit. 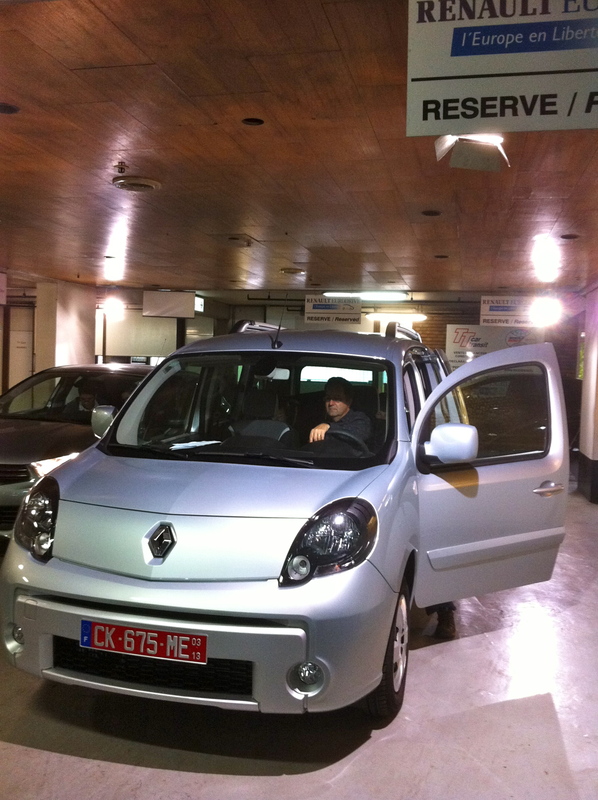 We are really here to pick up a Renault that we have leased for 5 months. We made a last-minute decision to get a car for the rest of of Europe leg of the trip. 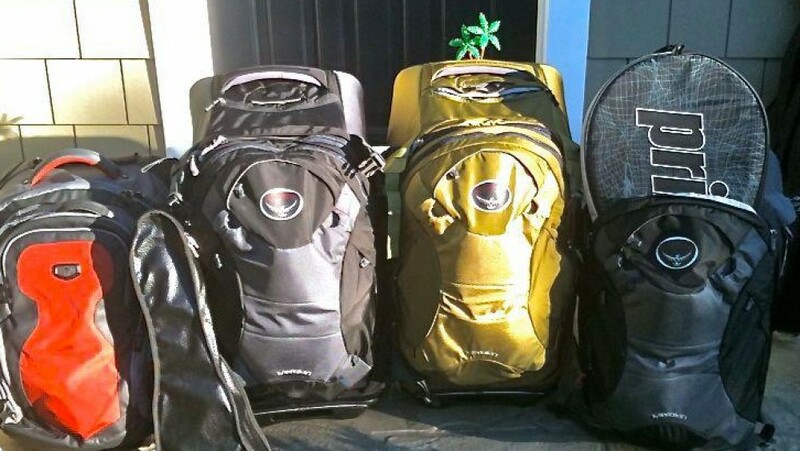 In England it became pretty obvious that trying to move with all our bags on trains and buses, then renting a car for a week or so to do day trips was just going to be too cumbersome. We did move pretty well through London, on the Eurostar train, then to our apartment in Paris, but to do that every time we moved…not. And the car will allow us to collect a little more stuff. Gigi has purchased some art supplies that don’t fit in our bags, for instance. Good to have, as she is enjoying painting and she can give the boys art lessons. Also, we can now bring supplies like olive oil and laundry detergent with us when we move. Renault offers a lease program on new cars, it apparently lets them resell the relatively new cars without having to include a new-car-tax in the sale. Cars can be leased from 21 to 175 days. We are getting a brand new Kangoo, which is somewhere around the size of our old Honda CRV, I think. The gas mileage will be something like 45 mpg, however. It is a manual drive diesel engine. This engine type will probably be the future of American cars, too, since the bailed out automakers agreed to increase fleet mpg dramatically. Paris already feels different from London. We don’t know anyone in this city. 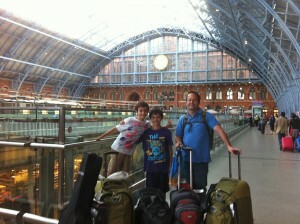 In London, we were having a great time staying with old friends. Now, looking out the window of our 8th floor apartment, this city has a much different feel. London is so flat, without many vistas due to the buildings being so tightly packed and very uniform in height - either two-story row houses or four-story blocks of apartments. Here in Paris, we can see several different apartment blocks, some low rise, some higher, nothing very uniform in the way the buildings were built. We can see into the apartments. It is a nice evening and people have their windows open. A bit of voyerism and imagining who these Parisiennes are and what they do with their lives. Life in the Cottswolds has been very enjoyable. I have been in the Cottswolds for 3 weeks now. 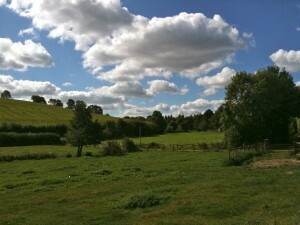 I spent my birthday here. 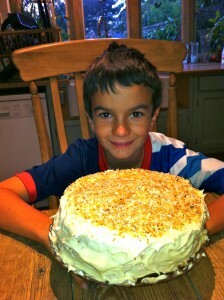 Mom made me a coconut and lime cake in the AGA oven. 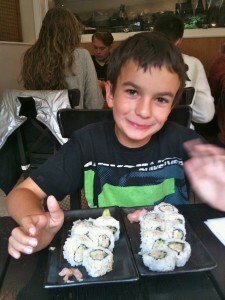 For my birthday lunch, I had 2 California rolls at a sushi restaurant called Soushi in Cirencester. I had a lot of time to hang out here. I watched movies, played on my iPad, and watched more movies. The house has a big back yard. We could play cricket and badminton, and fly my helicopter. We went on a lot of walks. We saw and petted horses. 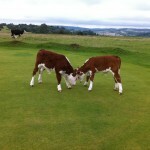 We walked among cows and calves on the Commons. Thanks Stuart and Glynis for letting us stay at your wonderful house!